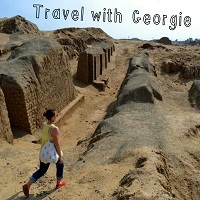 Travel with Georgie: FAQ: jak jsem se k tomu dostala? // FAQ: How did I get this opportunity? FAQ: jak jsem se k tomu dostala? // FAQ: How did I get this opportunity? Jak jsem se k této cestě dostala? Nebo jak jsem na to přišla? Minulý podzim jsem dostala nabídku zúčastnit se jedné akce pro mladé lidi z různých provincií Jednoty bratrské. Přišlo mi to moc zajímavé, v té době ale o tom nebylo moc informací, jen to, že by se jezdilo dva týdny po Evropě, a stálo by to 1500-2000 euro. Ačkoliv mě to moc lákalo, cena mi přišla přehnaná. Říkala jsem si, že bych na tuto cestu jela jedině kvůli těm lidem, kteří by se toho účastnili, protože Evropu, a obzvlášť státy, kudy by se jezdilo (Čechy, Německo, Holandsko) celkem znám. Jela bych tam hlavně kvůli navázání kontaktů. A tak nějak v tu chvíli vznikla myšlenka, že vlastně ani nemusím jet na takový zájezd, abych získala kontakty. Třeba bych mohla přímo jet někam do Latinské Ameriky, a poznat, jak funguje naše církev tam. Chvíli jsem nad tím přemýšlela, a pak jsem se rozhodla zjistit si něco více o těchto zemích, a jak a kde tam funguje Jednota. To už byl leden, a tak se to hezky sešlo, že jsem si během zkouškového dělala pauzy, a koukala na fotky z Kostariky, koukala na ceny letenek do Nikaraguy, a tak dále. How did you get this idea? How did you decide to go? Last autumn an offer came to participate in an event for young people from different provinces of Moravian Church. I thought that it was really interesting but there were not much information, only that we would travel during two weeks while learning about the history of the Moravian Church, and the cost of this trip would be 1500-2000 euros. Wow, that’s quite a lot. I thought that it was an interesting idea, and I would like to participate but not for the travelling (we would go through the CR, Germany and Holland – the places I know the most) but only because of the people I would like to get to know and create some international contacts. And from that one lead to another and I got the idea that I didn’t really need to go to that trip to meet the people. Maybe I could go directly to Latin America and find out how things work there. I spent some time thinking about this and then I decided to find some information about those provinces in Latin America. It was already January and it just came up so nicely together with the exam period :D it always does. So while studying I was making many pauses to check out the pictures from Costa Rica, flights to Nicaragua, and so on. I decided to find a job during my 5-month long study stay in Spain to get funds for my travel. Then, I thought, I could start contacting the churches in Latin America asking if they could use my help there during the summer. In Spain, the job market is not very good for the foreigners so I didn’t find any job except few private English classes. But I didn’t give up and meanwhile I contacted our bishop Evald Rucký who gave me an address to contact the bishop of North American province Sam Gray. Sam then told me about an existing Antioch program that focuses on young adults with the desire to serve. And so I contacted Jill Kolodziej. The first emails we exchanged were in April 2013. At that time I was still searching for the answer to my question if this was something I should do. I wasn’t really sure whether this desire wasn’t just my ambition of doing something, whether it wasn’t just a desire to travel. I didn’t this trip to be some kind of holiday. I really wanted to serve. And I knew that if I went just to fulfil my dreams it wouldn’t turn out to be that good. I knew that I needed God’s support to make this trip come true. However, I got some encouraging words from friends who prayed for me and told me that God wanted to make use of my dreams and if this was in my heart, I should do it. Also, in that time I realized that there was no sense in waiting till I would get a job. I knew that if I trusted God completely, the money would just come. I made the decision to take this challenge and also changed the planned time to go. I wouldn’t go during the summer but during the winter semester. Because of Erasmus, the subjects I study got a bit messed up and I knew that if I took the winter semester off, I could continue my studies easier then. I filled the application form for the Antioch Program. The first few months the conversation was a bit slow and a bit vague. But there was still time to arrange things. I was patient and waited. In the middle of the summer holiday I started being a little bit nervous. I still haven’t gotten any news and I thought I needed some sort of idea of the money I would need, and also the time to arrange things. It was the end of July so that meant only two months till my planned departure because in the application I was available since the beginning of October till the end of January. In the beginning of August I joined an event recommended by Jill. It was an event with two parts. The first one was a travelling one, called Karavaan, and the second part was an International Youth Festival. It was organized by Atlantic Bridge organization. During this event we went with my small group to Herrnhut (Germany). One of the tasks we had there was to get some infromation about the history of that town and get some contacts with the locals. Thankfully, we were hosted by a very nice woman called Erdmute. She works in the Moravian Church there as a visitors pastor. She accepted us as her own children and helped us a lot during our stay. I just loved that time there. Anyway, when my parents brought me there, they told her about my plans of going. She then told me that she knew Jill and if my Latin American mission didn’t work out, I could try contacting the Esperanza for Bethlehem congregation. She said that she knew the pastors and I might put in use my knowledge of Spanish there. I was very happy about that information; I saved the link for that church but still believed that Jill would reply to me with some location to send me to. However, it was getting closer and closer so in the middle of August I wrote her about my coming departure and about my need of some new information. When she replied to me it came out that there had been a misunderstanding. What I mentioned in the application form were the dates when I was able to serve. And I thought that it meant the time I wanted to spend serving. But it actually meant that during that period of time I would be sent somewhere. And because there was no placement at the moment, I wasn’t placed yet. Jill also didn’t expect me to be able to go for such a long time. She also found out that there was another girl from Ohio interested in going but from mid-December till mid-January during her winter break. I understood that it was better not to travel alone so I accepted that. Soon, I found out that we were chosen for a Peru misson!! Yaay! :) But still. What would I do in the Czech Republic till the middle of December without studying at the university or any job? I know there is always something to do but I did want to do something meaningful. I remembered the words of Erdmute and wrote Jill about my plan to contact that church. Jill told me that she knew that church and she would contact them for me if I wanted. I knew that it was much better if she did it when she knew these people. So I waited some more time. And you already know how it ended. I got a message that they would like to receive me in Bethlehem for the month of November. The date is flexible, depends on my funds and flights. dobrovolnické pobyty pro mladé, to by se mi taky líbilo :) co přesně budeš dělat? Pochopila jsi to dobře, jsem věřící :) Já jsem o církvi v LA taky nevěděla moc. Ale ta naše pochází z Čech, a je právě skoro po celým světě. A jsem celkem hrdá, že to tak je :) Nestyď se, já si myslím, že to je normální. V Čechách je ta informovanost celkem malá, a pokud se člověk o to přímo nezajímá, tak se toho moc nedozví. určitě se rozepiš :) doučovat by mě taky bavilo, angličtinu? jet sám má pro i proti nu, aspoň tě nebude nikdo omezovat a Peru se neboj, určitě to zmákneš!